Added the 'glitch' sorry if its not that fab a deal! That's not the glitch Chanchi, if you add 3 of the same item (£7.50 ones for example) they total £12.50 instead of £15. It's not working for me on items that have been reduced. 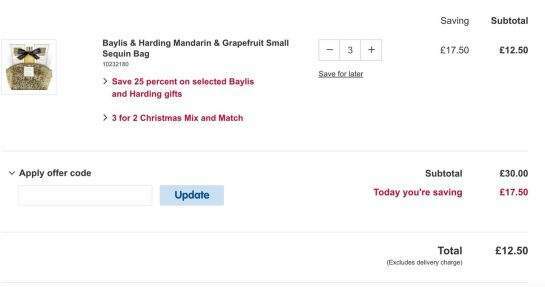 For example sanctuary candle is reduced to £4.50 but when it goes to the basket it is full price. Is anyone else finding the same? 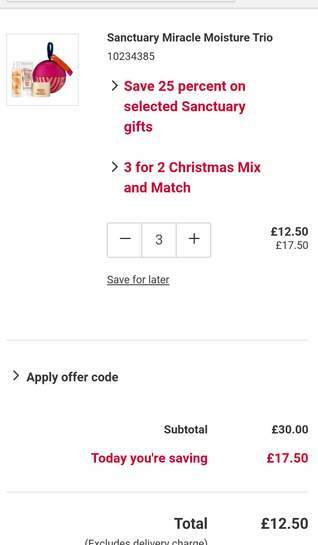 That's not the glitch Chanchi, if you add 3 of the same item (£7.50 ones …That's not the glitch Chanchi, if you add 3 of the same item (£7.50 ones for example) they total £12.50 instead of £15. 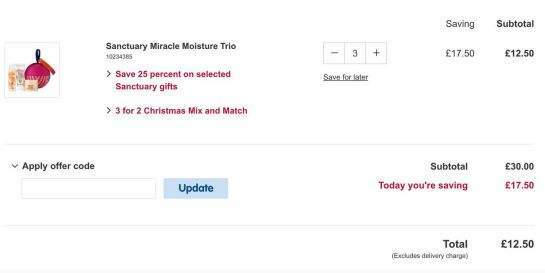 It's the original price of the third item ( ie lowest value one) which is being deducted from the total value and not the 25% off price. Was it 4 of the 'Was £6 now £4.50' items? All 3 same items? Brilliant thanks! That's one present for the step mother in law bought and 2 x teacher presents. It's not working for me on items that have been reduced. For example …It's not working for me on items that have been reduced. For example sanctuary candle is reduced to £4.50 but when it goes to the basket it is full price. Is anyone else finding the same? Jack Wills Body Care DuoTed Baker CollectionJack Wills Body Spray TrioI …Jack Wills Body Care DuoTed Baker CollectionJack Wills Body Spray TrioI think! If you click on the filter button once on the 3 for 2 page from the link you can select to view all the items with reductions. I think you have to buy 3 of the same thing. Hey, where is the credit to me?? Edit..... my comment is not directed to you! To the site that copied my 'exclusive to hukds' deal! Well that's right isn't it? They are £12 each, so £12 x 2 is £24 pounds. You would have got the third one free? Boots changed their site a year or so ago so glitches don't come by as much now!! Really don't like their new site so don't go on it much at all! Thanks op ordered 3 of these for £31.25 plus used TopCashback too boots.com/san…554 That’s my a present for my sister and sister in law sorted and a treat for me for my birthday on the 29 th. heated added.